The use of advance signal processing techniques (e.g. wavelets, fractals, fuzzy-logic, polyspectra, stochastic models) in (bio)music composition. The work is based on the concept of metamorphosis, as it characterizes the variations of the multiple levels of resolution of the existence. Motivated by the F. Kafka’s homonym work (1935), an external metamorphosis is constructed (Kafka: man to cockroach, Here: actor to guinea pig), which gradually is transformed to a normalized version of the external environment in which the internal metamorphoses take place. The latter, touch the space of emotions that are elicitated from the alterations in relationships and dependencies in a structural connectivity network at the sound space; there, the experiential interaction is expressed through the biosignals that reflect the internal world to a sound projection, which is mobilized and transformed from the ‘interferences’ of the conductor’s expressive movements. The trajectory of the metamorphosis puts forward the ‘sound liquidity’ and the continuous deconstruction/catastrophe at the foreground, stetting them as the basic ingredients of the work, in an alternative perspective, that of the so called ‘biomusic’. The work is a commission of Swiss Contemporary music ensemble UMS ‘n JIP and part of their ‘Greece Project’. It is based on the construction of a “common brain” in a bilateral perception; the one that is being shared and the one that does not deviate from the norm. Starting from the point of existence (through the understanding of breathing), the multi-layering proliferation of the neurons is developed, followed by the network-activation, text-training, external-stimulation reaction and, final, emotional responsiveness. The performers participate in a formation of the sound-scape with the real-time acquisition of their encephalogram and its transform to sound material, creating an experiential perception of the “common brain” in many different aspects of its development and formation. The experiential stochasticity brings the “sound liquidness” and continuous de/construction to the foreground, making them as basic structural ingredients of the dynamically produced composition in an alternative perspective, that of the, so called, Biomusic. 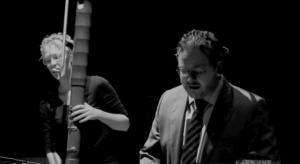 UMS ‘n JIP [‘umsnjip] is one of the most innovative and accomplished Swiss contemporary music ensembles. Founded in 2007 by Ulrike Mayer-Spohn [UMS] and Javier Hagen [JIP], it is, alongside Ensemble Modern, Ensemble Intercontemporain, the Kronos Quartet and Ensemble Recherche, one of the most active contemporary music ensembles worldwide commissioning around 10-15 works and performing more than 100 international concerts annually, including mobile chamber operas & multimedia performances. UMS ‘n JIP explore new musical and scenic settings for voice, recorders and electronics ranging from live to digital performance as well as European to non-European music. Since their studies (composing, audio design & musical performance) in Holland, Germany, Italy and Switzerland, UMS and JIP have been invited for guest lectures at the music universities of Paris, Moscow, Istanbul, Adelaide, Shanghai, Hong Kong, Riga, Rostov, Taganrog, Barcelona, Basel as well as to prestigious contemporary music and theatre festivals on 4 continents where they have premiered more than 200 works as soloists and as a duo, collaborating with both world famous and aspiring young composers such as Goebbels, Rihm, Kagel, Reimann, Eötvös, Stefan Pohlit, Huang Ruo and Guo Wenjing. 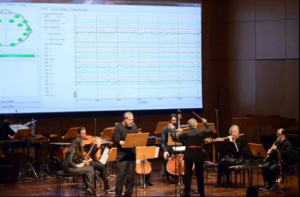 The work Brainswarm belongs to a series of works that derive their content from the site of biomusic, combining information in real-time from the conductor (both from his/her brain and from his/her movements-gestures) with the sound of natural instruments. 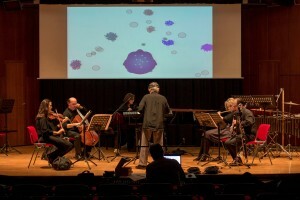 In this work, an attempt to simultaneously connect the real with the virtual space is initiated, where each real instrument is mapped to a virtual one, in which ‘lives’ a swarm. Similarly, the spatial distribution of brain activity by the conductor (as recorded by 14 EEG channels), is assigned to a swarm that guides the behavior of other swarms, placing to them obstructions and/or prays, turning them occasionally, to detectors, predators and dominators in their environment. Consequently, their spatial variations are mapped to transformations in the sound field, in an attempt to couple the experiential behavior with sound structures. The bio-conductor directs both real and virtual instruments, activating experiential (brain activity) and cognitive (gestures) procedures, which give him/her the role of the protagonist (soloist) in both spaces. The work is developed on the axis of the behavior in a symbiosis, in both the real and virtual space, which tends from individuality to social integration, with all the potential consequences of this trajectory. Leontios J. Hadjileontiadis was born in Kastoria, northern Greece in 1966. 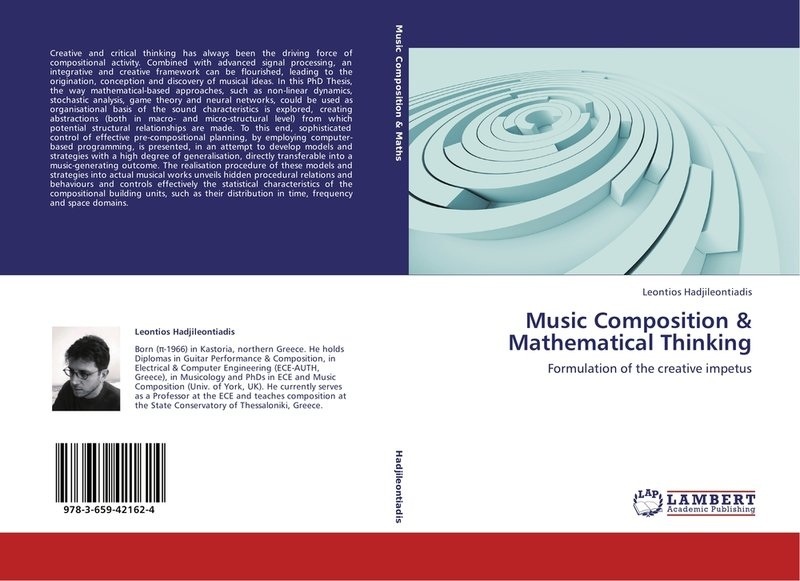 He studied music theory and classical guitar obtaining Diplomas in Guitar Performance (1993-Prof. F. Bakses, Macedonian Conservatory, Thessaloniki (MCT), Greece) and in Composition (1997-Prof. Th. Antoniou, MCT), both with honors and 1st Prize. He also holds a Diploma in Electrical Engineering (1989, Aristotle University of Thessaloniki (AUTH), Greece), a PhD in Electrical and Computer Engineering (1997, AUTH), a PhD in Music Composition (2004-Prof. David Blake, University of York, UK) and a Diploma of Musicology (2011, Aristotle University of Thessaloniki (AUTH), Greece). He currently serves as a Professor at the Dept. of Electrical & Computer Eng., AUTH, and teaches composition at the State Conservatory of Thessaloniki, Greece. Up to now, he has written 86 works and awarded 15 times. He has been a member of Greek Composers’ Union (GCU) from 1993; since 2001, he is a Board Member of GCU and ISCM Greek Section. His works have been played (or broadcast) both nationally and internationally. 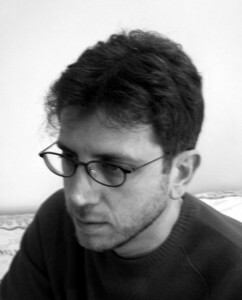 His research interests include the use of advance signal processing techniques (e.g., wavelets, fractals, fuzzy-logic, polyspectra, stochastic models) in (bio)music composition and in biomedical engineering.